January was a slow month, but February flew by! I'm trying to even remember why. Phoenix and I were both sick. I honestly haven't had a cold since before Phoenix was born (and I currently have a fever, so I'm catching up for lost time apparently). I get sinus headaches and sometimes my throat will be scratchy, but it's allergy related. Phoenix started his croup cough and then woke up with gunk in his eye. We assumed it was pink eye, but his pediatrician diagnosed Phoenix with an ear infection. Within a day the antibiotics cleared the eye gunk. Bless modern medicine. I had constant ear infections as a child. Tubes were put in my ears, so I'm very thankful Phoenix went 18 months before his first round of antibiotics! I mentioned last month Jordan and I signed up for Movie Pass. I'm thinking through each month to make sure we have a chance to see a movie. Last week we saw Black Panther. I'm considering bringing a blanket with me next time. Our theatre has reclining seats and they are very comfortable! Planning | Logistics for the month. Family is visiting, which is awesome because we won't have to get as many sitters for the month. Seeing | How easy it is to make impulse purchases. I'll recap next month, but Jordan and I are in a no-spend March. We needed to reign in our budget to reach a few goals. How I approached this was to limit groceries to essentials -- no new recipes that involve special ingredients (spices, sauces) -- and a general mindfulness of not over stocking up. Obviously no clothes, makeup, books, records (Jordan's impulse weakness), household items, etc. Phoenix needed spring clothes, so I used credit card rewards points and ended up spending $5. He also needs new shoes, but I factor that as necessary. An example of something I need, but isn't completely necessary are cereal/dinner bowls. We still use our wedding registry dishes, but we're down to 5 bowls. We replaced our glasses from a thrift store, so I'll keep my eye out for bowls. Making | Progress on our taxes. I know I keep talking about this, but if you are self-employed (or are married to one) you'll understand the struggle! I always discover an error on a 1099, so that gives me solace. Tax season is hard on everyone! Pretending | That winter is over. At least in Nashville! Wearing | Looking through my closet I realized my basic t-shirts were lacking, so I purchased three Everlanebox t-shirts. They are only $16 -- affordable and ethically made. The slight crop works with all of my high waisted jeans. 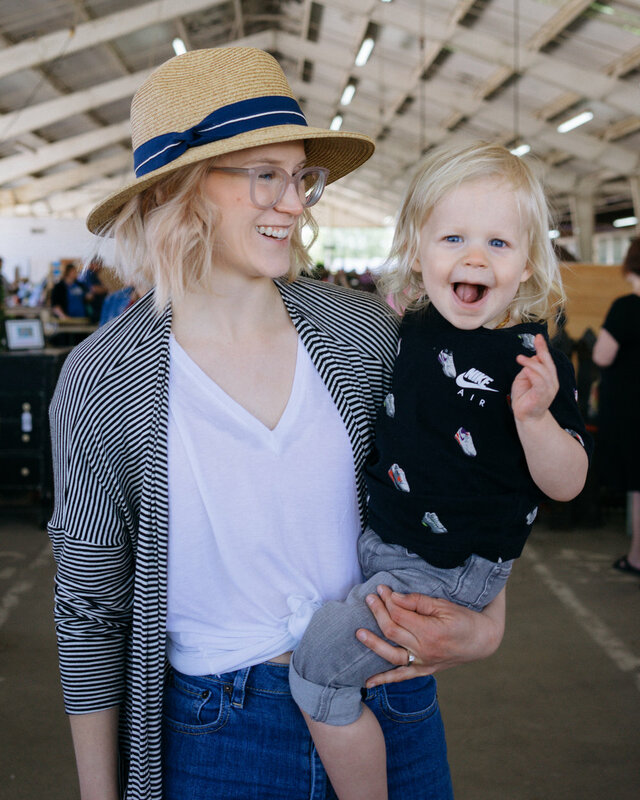 Last spring/summer I was still less than a year postpartum, so I didn't quite know where my body would land and thus I wore through the few shirts that fit. Linking with Anne and Sarah.